Hara’s landing a customer a week, says CEO. We have just begun to fight against ZigBee, GainSpan's new CEO would like you to know. 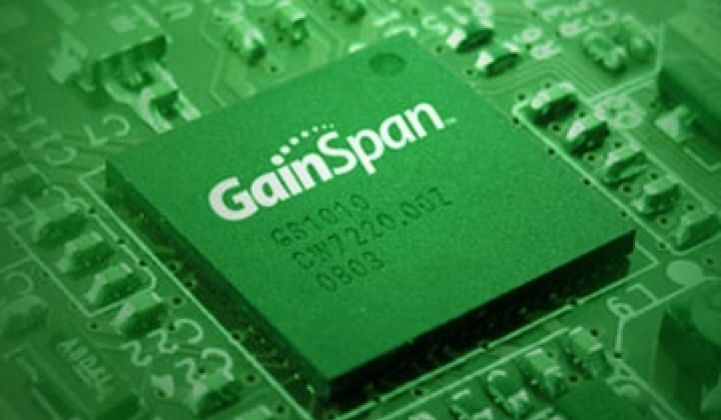 Greg Winner, an alum of Atheros, Texas Instruments and other companies, is the new CEO at GainSpan, which has developed an energy-efficient WiFi chip for home and building networks. Former CEO and founder Vijay Parmar, meanwhile, will head up business development. The switch in executives is aimed at scaling up the company for the looming battle over home networks. Although ZigBee has been implemented in a number of utility trials, both Parmar and Winner say the race is far from over. Most trials, they say, are just that -- experiments to see whether home and office power consumption can be curbed by putting intelligence and communication capabilities into washing machines, lights, thermostats and other devices. WiFi got off to a slower start in this market, but it is now gaining adherents, particularly among appliance and white good manufacturers who want to be assured that the networking they insert into their products will be compatible with equipment coming out from other vendors. WiFi enjoys a broad and deep footprint: nearly every home with broadband has WiFi streaming through it already. And if a repairman wants to check on the health of a fridge, he can use an iPhone to pull information out of it; WiFi is standard on all modern smart phones. "They (appliance makers) are pretty vocal about having more than one protocol," said Parmar. The National Institute of Science and Technology wants to solidify standards for home networking in the next few months and has indicated that the final home standards will likely allow for a few wireless and wired standards. Winner predicted that NIST may concentrate on one standard for power line networking, which is actually not hugely popular in the U.S. but enjoys a larger market share in Europe, and then pick a few different standards for wireless, including WiFi. Another factor that may pull in WiFi's favor: the smart meter may not be a central point for communications into the home. Instead, homes may be equipped with a router that collects all of the data from a person's appliances and then feeds that data to the meter. This way, the meter, which only gets changed every few decades, can be insulated from technological and standards changes to some degree. The box will be the thing that has to be versatile and multilingual. And most people already have one of these boxes in their homes: it's called a DSL gateway. GainSpan has to act quick, however, as the established WiFi manufacturers want to move into this market ASAP. Naturally, ZigBee vendors disagree. The ZigBee vendors also argue that they continue to improve the performance of their technology. We've chronicled that before and will continue to do so. Elsewhere, Hara, which makes resource management software, has inked a major deal with Safeway. The food retailer will deploy Hara's software to measure energy consumption and carbon output at 1,800 facilities, including many stores. The company came out of stealth mode last year, and has since raised $20 million and inked deals with Coca-Cola, News Corp., Brocade, and Akamai. Around 50 companies installed energy management systems like this last year, said CEO Amit Chatterjee, citing a Groom Energy research report, and Hara got about half of the deals. This year, 250 similar deals will be signed with various vendors. Hara is already off to a strong start, he added. The company is signing up a new customer every week. It is in negotiations with some big box retailers, as well. "We're staring to get into each of the verticals," he added: high tech, high tech manufacturing, media, retail, etc. Hara recently nabbed a contract with Inuit that formerly was handled by SAP, he said. (Chatterjee came out of SAP.) Many expect companies like Hara and Carbonetworks themselves to get snapped up by large, multinational software vendors like Oracle or IBM as the market expands. Meanwhile, the Illinois Institute of Technology has completed phase one of its Perfect Power Project for microgrids. The five-year program wants to study the feasibility of campus-sized networks. And in California, Glendale Water & Power has awarded a $4.2 million contract to Utility Partners of America for smart electrical and water meters.